You are planning the perfect outdoor wedding! Ah…. just imagine! The blue skies punctuated by white, fluffy clouds! The sun shining brilliantly on you and your guests! The warm South Carolina breeze rustling the leaves overhead! A storybook event! I will be spectacular. South Carolina receives 110 rainy days per year on average. So, with a 30 percent chance that your wedding day will receive a dose of liquid sunshine, what is a bride-to-be to do? First things first. Have a backup plan! Check with your venue to see if they have the facilities to move your wedding indoors if weather becomes a problem. If the weather is tossing a pop up thunderstorm on an otherwise sunny day, consider having a flexible timeline. After all, nobody says you HAVE to get married at 6PM! You may consider renting a large tent. Even if the weather remains sunny, your guests will appreciate being protected from the hot Carolina sun! Listen to the advice of the pros! Talk to your rental company about having a large tent at the wedding. As the date approaches, you can decide if you want the tent or not. You will lose your deposit (typically 50% of the cost of the tent rental) but that is a small price to pay for peace of mind! You are spending a lot of money on your wedding, don’t let a lost deposit keep you from reserving the facilities you need! Be sure to inform your guests that the wedding is outdoors so they can dress appropriately. You may even suggest they bring an umbrella along “just in case”. You can always move inside but that is, let’s face it… boring!!! Why not embrace the moment and get married in the rain! You and the wedding party can walk down the aisle carrying a variety of brightly colored umbrellas or parasols! If you plan ahead, you can even coordinate them with your color scheme. This will be a charming spectacle that your guests will be talking about for a long time! As a professional photographer, trust me when I tell you that your photographer will be THRILLED with the opportunity to shoot your wedding on a rainy day! The lighting will be amazing and the opportunities to capture truly unique moments will be plentiful! Be sure to talk with your photographer and videographer about how they will respond if the weather becomes rainy. Most professionals have the gear necessary to protect their equipment while capturing truly amazing moments! 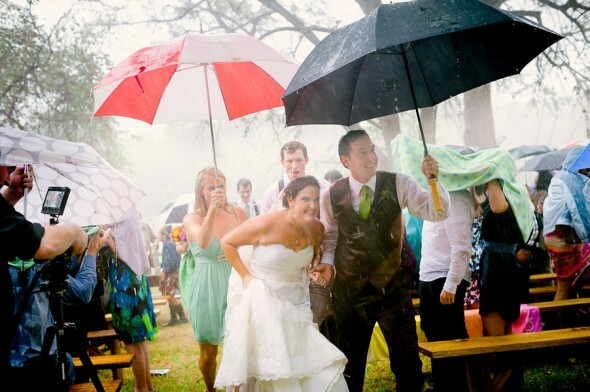 Bottom line: A rainy wedding day is not a disaster as long as you are prepared! Oh, and keep in mind that while Palmetto Partybooths is happy to provide indoor and outdoor photo booth service, we need protection from the elements! We will work with you to find the perfect place for your photo booth! Click HERE for samples of rainy wedding day pix!